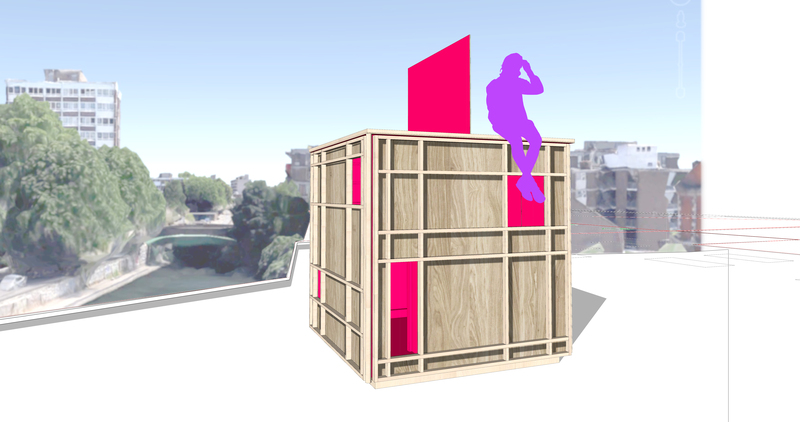 The box is a live-in studio space that unfolds to become an exhibition space slash installation. The fast-built, light-weight structure responds to the nature of London living, its seeming simplicity an antidote and comment on the busy and ever-transforming visual landscape of the city. 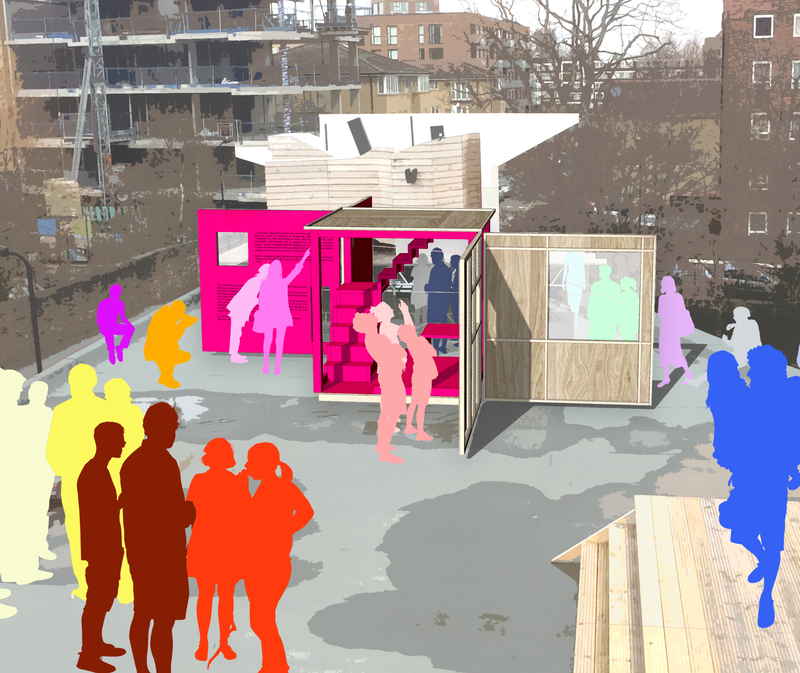 The Antepavilion commission is an annual competition to design and build an experimental rooftop structure on the Regent’s canalside at Haggerston in London. Working as an architect and art historian/curator, living in Hackney with our young daughter, our aim was to reflect on our own experiences and on the careers and lives of artists, designers, and architects that make up our community of friends and colleagues. The brief invited proposals of a built space that engages with ideas around alternative ways of living within the city that resonated with concepts around micro dwelling. We took this to consider the built-up nature of London living as well as the positive potential for exchange and collaboration. ‘Free’ space and funding are sparse, so our intention was to present a way to utilize resources, creating a single environment where one can live, work and exhibit. We took the ‘ante’ from ‘antepavilion’ to mean ‘before’, extending this to consider the idea of the incomplete, or the ‘unfinalizable.’ The creative world and the cityscape of London resists the notion of ending, both in terms of a transient population and the unending building and shifting of the landscape. This creates the potential for continuous dialogue and new methods of ‘becoming’, of participation and exchange. With this comes the discussion of survival and adaption, as we attempt to challenge institutional boundaries and social constructs of how to live. To be immersed is to find oneself involved deeply in a particular activity. To be absorbed, busy, distracted even. In our professional and personal lives we often found ourselves immersed in a world of creativity, and finding others immersed in their own creative pursuit, often at the expense of financial security and a ‘sensible’ job. We feed off the city and the way it shifts creatively and architecturally, a feeling enhanced by pop-up exhibitions and design spaces populating the East End and beyond. This project then, reflects the desire to utilize every corner of the city. We propose a form of urban dwelling that utilizes the often small spaces one or more individuals live in, while finding a solutions to present their creative practice. The closed form is representative of the entrepreneurial individual. It is reminiscent of the cardboard box, hinting toward the shipping containers found in the area and suggestive of visible homelessness, therefore a critique of substandard living that many face in the inner city. The unfolded cube symbolizes the individual acting as part of a creative community, sharing ideas, supporting one another intellectually and creatively. 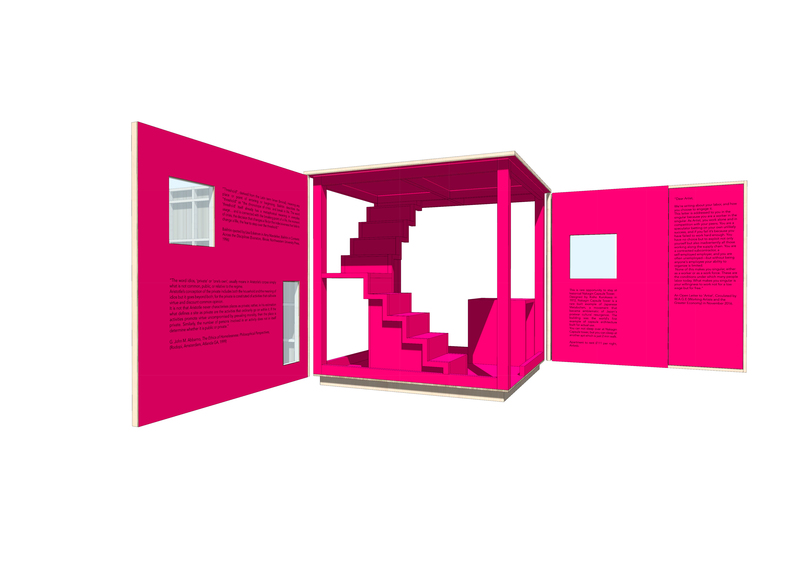 The pictures show temporary wall texts for the initial exhibition that reflect ideas behind the structure. While London thrives on cultural diversity and the young making it the spearhead of creativity and innovation, we want to provoke thoughts on, and possible solutions to the problems faced by those who attempt to settle down and want to raise a family. Our private and vocational lives are enriched by those determined to live a creative life in London, but inevitably the city risks the loss of valuable and diverse experience. So immersed are creative ventures in London, one can walk around the areas of East London and overlook the monuments to creativity and design bred in local workspaces and artist studios. Therefore our aim is to invite artists, designers, architects and other creative professionals to respond and create the potential for collaboration, to bring together all areas of the wider London community through an engagement and participation with art, architecture, fashion, theatre and music. For more information on the Antepavilion commission and the winning design, please visit http://www.architecturefoundation.org.uk.